Since their origins in the early 19th century, American railroads have been savvy in the use of imagery to advertise their services and attract riders. While passengers choose the train to fulfill the basic need to get from one place to another, part of the allure of a rail journey has also been the show right outside the window. As the train passes through the changing landscape and makes its scheduled stops, we’re allowed brief glimpses into the lives of others. Late 19th century railroads understood this natural human curiosity about one’s surroundings, and thus employed art depicting far-off places to entice travelers to buy tickets and explore the country. Brochures, buttons, posters and other items featured paintings, illustrations and photographs that provided national exposure to young and established artists alike. Advancements in printing technology during the Industrial Revolution meant that the railroads could produce high-quality, full color items at relatively low cost. One of the most beloved items, eagerly awaited by rail aficionados, was the railroad calendar. It usually featured a copy of an oil painting that highlighted aspects of the rail system, whether a flagship train, new equipment or a soaring piece of infrastructure. Once the New Year had passed and the excitement of the calendar had faded, the original artwork—usually large oil paintings—went on display in corporate offices or important stations. For companies like the Santa Fe and PRR, oil-on-canvas works remained the standard. Lacking the crispness of a photograph, they allowed the viewer to fill in the details with his or her own imagination, and therefore engage with the image on a deeper level. Creating a calendar was not first and foremost on the minds of early Amtrak leaders, whom had an immense task before them, including the need to create an organizational framework; hire and train employees; upgrade and standardize rolling stock and station facilities; institute a comprehensive national reservations system; and craft an advertising campaign to inform the public about its services. The 1981 calendar celebrated Los Angeles' 200th anniversary. 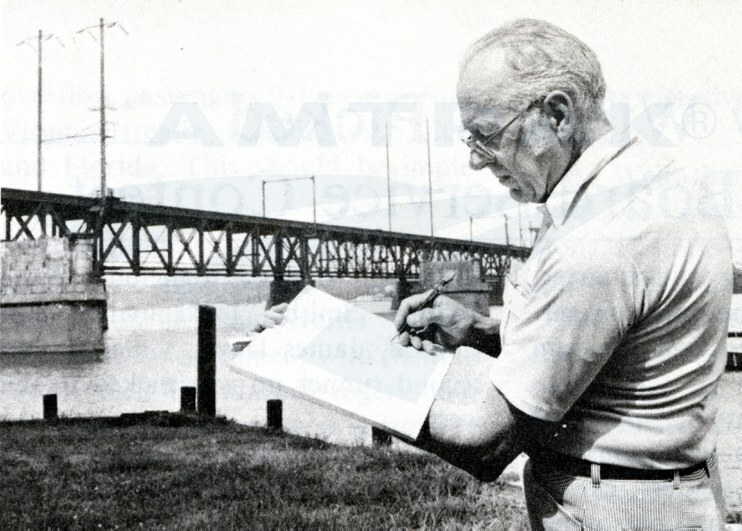 William Kratville, head of the Auto-Liner Corporation, decided to publish the first Auto-Liner/Amtrak calendar in 1971—before the new National Railroad Passenger Corporation had begun operations or gained its present name. 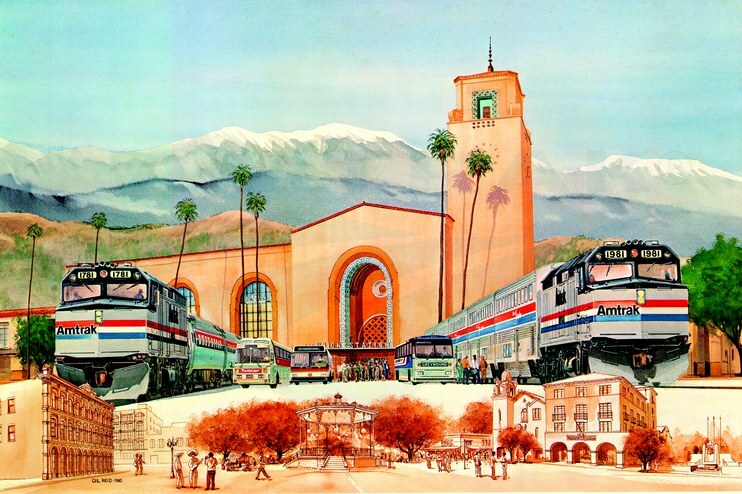 Since the final makeup of the rolling stock and locomotive fleet was undetermined, it showed a historical view of the 20th Century Limited by artist Gil Reid. Kratville would go on to create calendars in the succeeding two years. 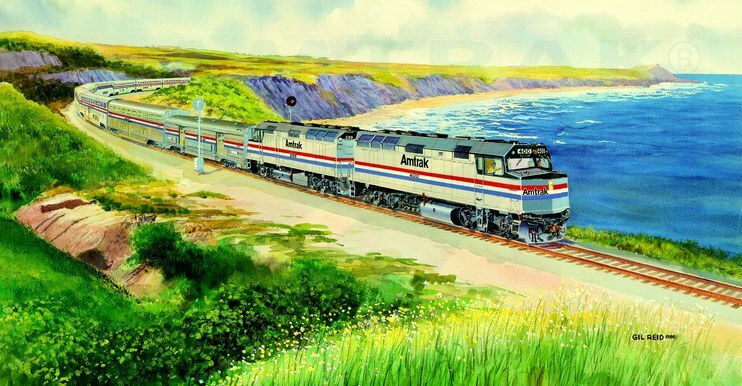 Amtrak first contributed funds towards the 1974 calendar, which featured a Reid watercolor of the Amtrak Super Chief racing across the desert. 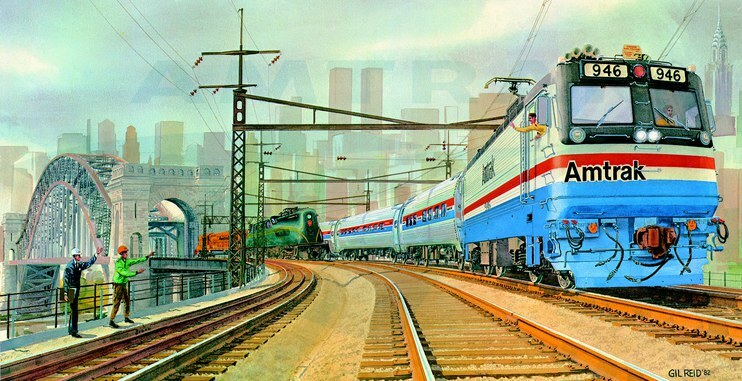 By 1976, Amtrak had taken complete control of the calendar program, producing wall versions that measured approximately 23.5” x 33.5”. Since then, the calendar has featured the work of noted railroad artists Gil Reid, Ted Rose, J. Craig Thorpe and others, in mediums including watercolor, oil-on-canvas and photography. An article in the January 15, 1977, issue of Amtrak NEWS noted that once the year was over, “the painting can be cut off and framed.” That year, the calendar cost $3.50. The New England Metroliner and GG-1 No. 4935 meet on the Hell Gate Bridge. 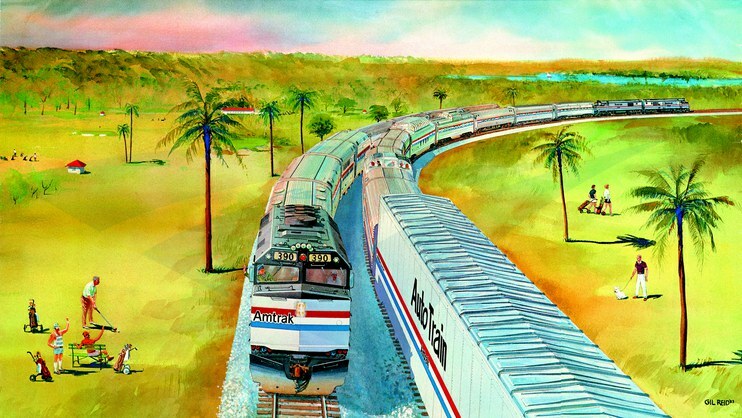 Of all the artists whose work has graced the official Amtrak calendar, Gil Reid holds the record for most pieces featured. His 18 works showcase trains such as the Empire Builder, National Limited, Broadway Limited, Auto Train and Crescent; E-60, AEM-7, F40PH and P30CH locomotives; and significant infrastructure including the Horseshoe Curve, Susquehanna River Bridge and Los Angeles Union Station. The California Zephyr traverses the Rocky Mountains west of Denver. Between the stations at Ventura and Lompoc, the Coast Starlight hugs the stunning California coast. “Dad was a real people person who could talk to anyone…I think he was surprised and happy that people responded so positively to his work,” says Kaploe. After moving to Olathe, Kan., many years ago, she stopped at a local McDonald’s, where she found the walls lined with her father’s work. The owner, a rail enthusiast, had decorated the restaurant with Reid’s prints. “When I took him there later, Dad was just awe struck, but so pleased,” Kaploe recalls. For most of Reid’s association with the Amtrak calendar, he worked with Director of Special Projects Bruce Heard, who would consult with the President and CEO on a theme for the year. With the subject chosen, Heard and Reid discussed the overall design to include the location and equipment to be featured.9 Commenting on the relationship between Amtrak and its calendar artists, Heard once noted, “I rely heavily on the artist; I want the artist to tell me if I’m wrong [from an artistic standpoint].”10 While it was important to convey Amtrak in the best light, the artist was allowed freedom in his methods. Back in his studio, Reid worked from memory as well as sketches and photographs made during the location scouting trip. Gil Reid’s work for Amtrak, primarily done in watercolor, displays his technical precision and signature attention to detail. 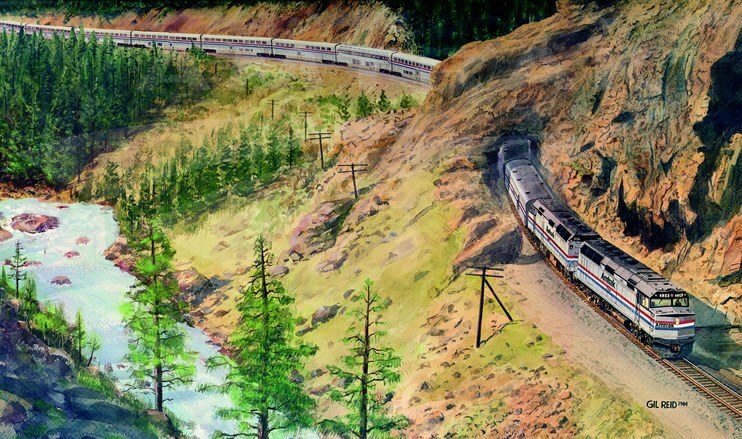 The bright but soft colors of the landscapes—greens, pinks and browns—evoke a happy, positive response from the viewer, while the trains’ bold red, white and blue paint schemes draw one’s eye to the equipment. In many cases, Reid effectively used subtle color variations and light pencil lines to create additional texture. Through thoughtful perspectives, trains often stretch into the distance, allowing the viewer a closer look at the various locomotives and cars. Although beautiful landscapes, including snow-capped mountains, bayous and stark deserts, are found in the paintings, the trains always take center stage. The image for the 1986 calendar shows the Crescent passing Washington landmarks such as the Jefferson Memorial and Washington Monument as it heads south and across the Potomac River. Looking closely, one can see the ornate detail of the Capitol dome, the sharp lines of the train’s paint scheme and small touches such as the Amtrak logo on the hat of the locomotive engineer. Daughter Sara Kaploe reveals, “Dad loved to put people in his paintings and would often invent backstories for his characters.” This demonstrates his love not just for the raw power of the railroad as represented by locomotives and fast trains, but also for its human side—the men and women who give life to the industry. The Auto Train and Silver Meteor meet in sunny Florida. Visit the Amtrak store to see the 2014 wall calendar, which features the Empire Builder as it crosses the Gaynor Trestle in the Cascade Range. 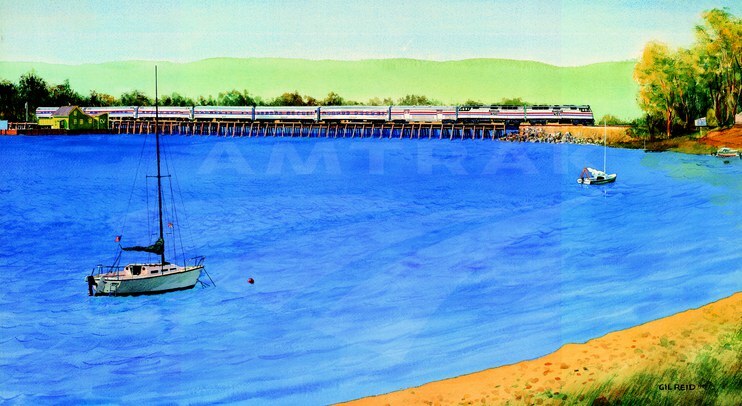 A smaller desk calendar shows the Coast Starlight passing close to Puget Sound. In both images, the trains are led by Locomotive No. 42, which in 2013 was given a patriotic paint scheme to commemorate the 50th anniversary of the Vietnam War and honor all Americans who have served in the armed forces. For additional videos of Gil Reid speaking about his career, visit GilReid.com. 1Dan Cupper, Crossroads of Commerce: The Pennsylvania Railroad Calendar Art of Grif Teller, (Mechanicsburg, Pa.: Stackpole Books, 2003). 3Dan Cupper, “Calendars for All Time,” Trains Vol. 56, no. 1 (January 1996). 4Amy Rabideau Silvers, “Reid had one-track mind for trains,” [Milwaukee] Journal Sentinel, January 8, 2007. 5 “Railroad’s ‘Picasso’ Captured History of Trains,” Waukesha Freeman, January 6, 2007. 6 Amy Rabideau Silvers, “Reid had one-track mind for trains,” [Milwaukee] Journal Sentinel, January 8, 2007. 8Sara Kaploe. Interviewed by Amtrak History. Telephone interview, Washington, DC, January 25, 2014. All quotes by Kaploe are drawn from this interview. 9 Dan Cupper, “Calendars for All Time,” Trains Vol. 56, No. 1 (January 1996).